Coracias galbula Linnaeus, 1758, Virginia. English: Northern oriole, black-backed oriole, Bullock's oriole; French: Oriole de Baltimore; German: Baltimoretrupial; Spanish: Bolsero de Baltimore. 7-8 in (18-20 cm); female 1-1.4 oz (28-41 g), male 1.1-1.4 oz (31-40 g). Sexually dimorphic in color. 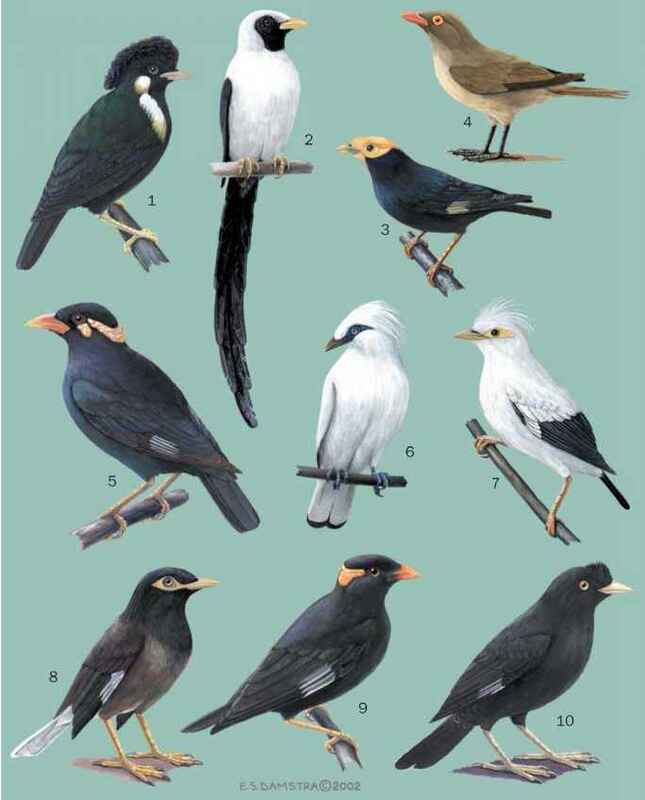 Males with a black head, wings, and middle tail feathers, and yellow-orange on the breast, belly, shoulder, and the tips of the tail, with white markings in their wings. Males in their second year resemble females. Females, which are variable, are yellowish or orangish green, usually with some black on the head, and greenish gray wings. Juveniles resemble females, but lack black, and are usually duller in coloration. Breeds in eastern North America, from central Alberta and southern Quebec south to northern Louisiana and central Georgia. 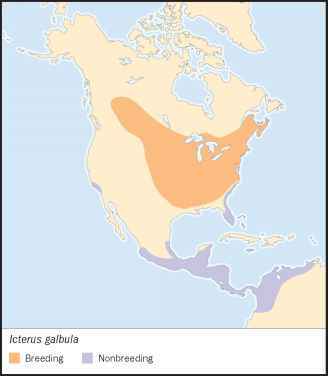 Winters from central Mexico south to northern South America, Florida, Jamaica, and along the coast of southern California. pended from the branches of a tree. Generally 4-5 eggs are laid from May to mid-June. Incubation 11-14 days; fledging 11-14 days. Single brooded, but replacement clutches may be produced. Not threatened. Widespread and common, but numbers declining in many areas. Destruction of suitable habitat for them on the wintering grounds may be affecting numbers.